"United Church Seminary students relaxing outside, ca. 1905, St. Paul, "
A common practice in the early part of the 20th century was to have photographs printed on "picture postcard" stock. 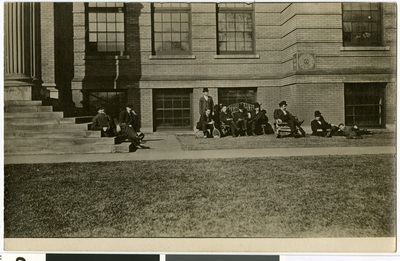 This photo, from the collection of Constance W. Johnson, shows United Church Seminary students relaxing outside the seminary building, ca. 1905. Back of postcard reads: LTS seminary students outside Bockman Hall ca. 1905.